At lunchtime on the 13th February, I was browsing Valentine's Day cards in a half-hearted attempt to find something for my husband. But when it comes to words of romance I tend towards the sarcastic end of the spectrum. I'm ok with jokes and silliness, but it's hard to convey depth of feeling with puns and rolling eyes. So I decided this year I wouldn't use words I'd use pictures. On a whim, I decided to make him a cookie. And not ten minutes later, I had another whim. I decided to film the cookie being made. This cookie took a long time. A very long time! And so the film has ended up in two parts. 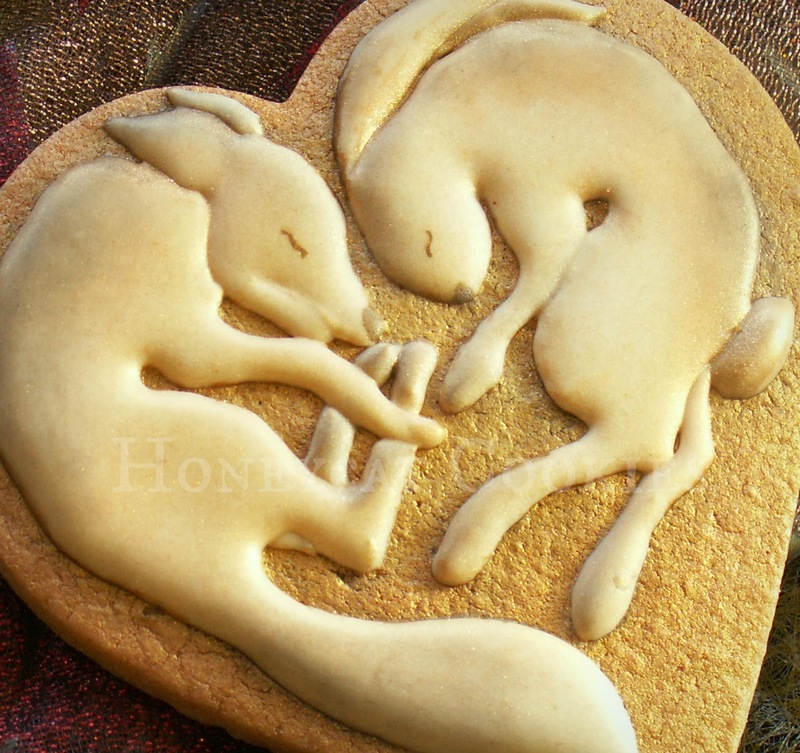 I had the idea for the fox and the hare from a variety of sources. As a child I loved the work of Kit Williams (I still do), and spent many hours pouring over his incredible creation Masquerade. There is a tranquil, surreal quality to his work, with a photorealism that makes his world slightly eerie. The buried golden hare waiting as long as it might take for a reader to unpuzzle the book is a haunting idea. It's hard to think of something that conveys patience and steadfastness as effectively as that hare. More recently the work of both Jackie Morris, author, illustrator and artist, and the artist Mister Finch have intrigued me. Both use hares and foxes as recurring motifs, and both seem to me to have that eerie, tranquil quality I loved as a child in Williams's work. 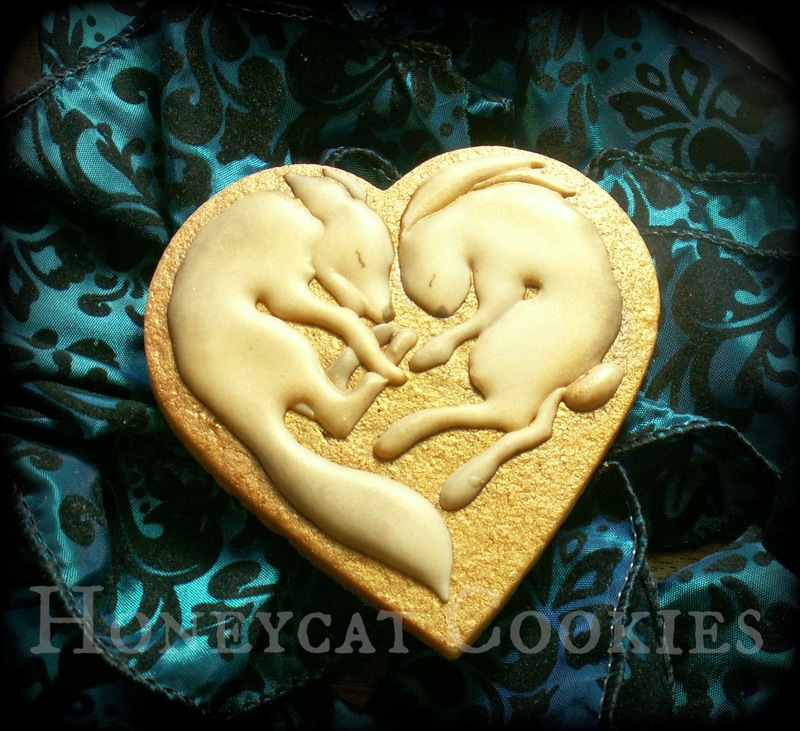 In particular I came across Morris's The Space Between the Fox and the Hare, where visually the space between becomes a heart shape, and of course conveys something of that awful sentiment I refuse to commit to words on the 14th February... Morris often uses gold backgrounds to her paintings, and so would I. I sprayed the blank cookie with a mixture of gold and bronze edible lustre. 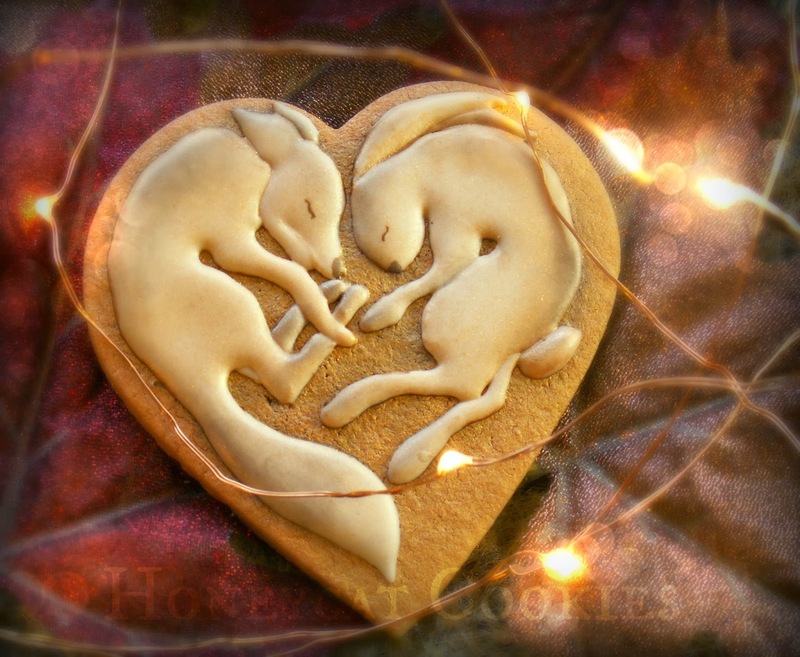 So I sketched the pair within the confines of a traditional Valentine's cookie, using their curled up shapes, and the fox's tail to create the heart shape I wanted, used the Camera Lucida ipad app to transfer the image to the actual cookie, and started piping. Once the piping was dry, I used a mixture of edible paint and lustre dusts to add definition. I think I had some idea in mind of Williams's buried hare: tones of earth and gold. In the end, as usual, I couldn't keep it secret and I made him open the box the same evening. So he still didn't get a token of lurve on Valentine's Day itself (see the sarcasm creeping in there?). I got him a chocolate orange instead.